Billy Kane (ビリー・カーン) is a fighting game character who hails from England, loves punk rock and plays the guitar very well. He fights with a weapon that can be either used as a bo or as a three section staff, which he can ignite with fire. He always tries to look out for his little sister Lilly Kane. When the new King of Fighters tournament began (in The King of Fighters '95) under the control of a man named Rugal Bernstein, Billy was ordered by Geese Howard to go in his boss' place. Billy hoped he would get to challenge The Lone Wolves (Terry Bogard, Andy Bogard and Joe Higashi) and get revenge for the defeat of his Boss Geese in Fatal Fury 1. He joined with a ninja named Eiji Kisaragi and a mysterious man named Iori Yagami. They all had their own reasons for entering the tournament, and their lack of teamwork meant they didn't do well. Billy's team didn't win, and at the end of the tournament, Iori went crazy and beat up Billy and Eiji. Billy swore revenge against Iori. When the next tournament (The King of Fighters '96) came around, Geese accepted the invitation and Billy stayed home. When Geese was betrayed by his teammate Mr. Big, Billy saved Geese's life once again. 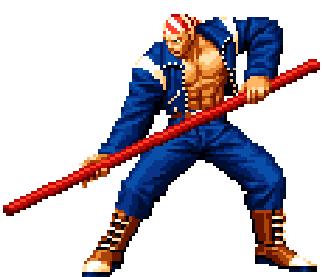 The next year for The King of Fighters '97 Geese sent Billy to investigate the mysterious Orochi power in Iori. Geese hired a sadistic outlaw named Ryuji Yamazaki and tricked a good freelance agent named Blue Mary to help as well. Billy tried to kill Iori, but Iori entered a rage called Riot of the Blood through his Orochi power and Billy was forced to retreat. After the tournament ended, Yamazaki demanded his pay from Geese. Geese and Billy fought Yamazaki and while the fight is not seen within the game, Yamazaki is seen walking away with his payment.